Word 2007 includes a special Envelopes command that can quickly and professionally print a mailing address (and your return address) on an envelope. You can send the envelope directly to your printer, or you can add the envelope to an existing document so that you can print your letter and envelope together. Open the Mailings tab on the Ribbon and then click the Envelopes button in the Create group. The Envelopes and Labels dialog box appears. If the current document contains an address, Word adds it to the Delivery Address field automatically. If the delivery address is not filled in, click Cancel to dismiss the dialog box. Then select the recipient’s address in the letter and click the Envelopes button again. This time, the address is filled in. If you want your return address to print on the label, type it in the Return Address text box. To print your envelope directly without adding it to a document, click the Print button. To add the envelope to the document, click the Add to Document button before printing. The envelope is added to your document as a separate page that appears before the first page of your letter. When you print the document, the envelope prints first, so you have to be prepared to insert an envelope into the printer. 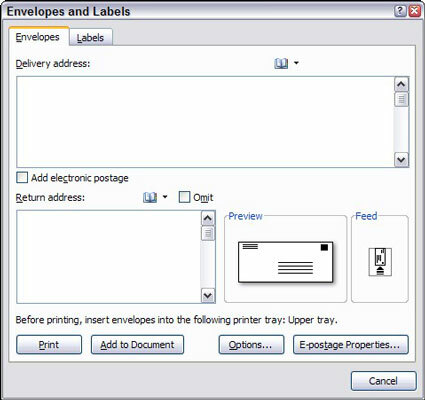 The exact steps for inserting an envelope depend on your printer, but most printers prompt you to insert an envelope when they want to print one.